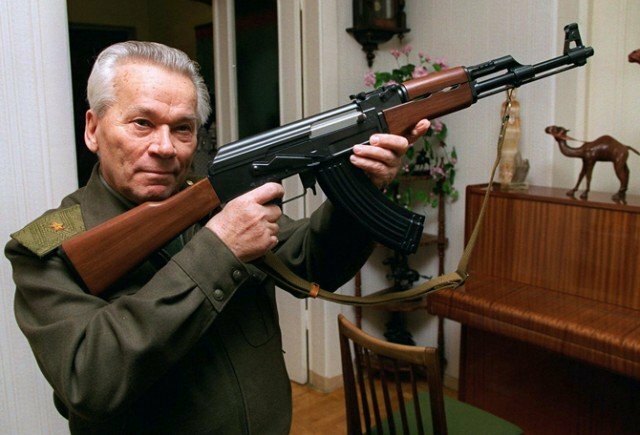 Mikhail Kalashnikov – the inventor of the Kalashnikov assault rifle – has died aged 94, Russian officials say. The automatic rifle Mikhail Kalashnikov designed became one of the world’s most familiar and widely used weapons. Its comparative simplicity made it cheap to manufacture, as well as reliable and easy to maintain. Although honored by the state, Mikhail Kalashnikov made little money from his gun. He once said he would have been better off designing a lawn mower. Mikhail Kalashnikov was admitted to hospital with internal bleeding in November. He died on Monday in Izhevsk, the city where he lived 600 miles east of Moscow, an official there said. Mikhail Timofeyevich Kalashnikov was born on November 10, 1919 in western Siberia, one of 18 children. In 1938, he was called up by the Red Army and his design skills were used to improve the effectiveness of weapons and equipment used by Soviet tank regiments. Mikhail Kalashnikov designed the machine gun after being asked by a fellow soldier why the Russians could not come up with a gun that would match the ones used by the Germans. Work on the AK47 was completed in 1947, and two years later the gun was adopted by the Soviet army. Mikhail Kalashnikov continued working into his late 80s as chief designer at the Izhevsk firm that first built the AK-47. He received many state honors, including the Order of Lenin and the Hero of Socialist Labor. Mikhail Kalashnikov refused to accept responsibility for the many people killed by his weapon, blaming the policies of other countries that acquired it.